Multiple Grade 1 winner Good Magic, the probable favorite for next Saturday's Grade 1, $1.25 million Runhappy Travers, turned in a scintillating five-furlong breeze in 1:00.44 Friday morning in preparation for the Mid-Summer Derby at Saratoga Race Course. The Curlin colt is looking to become the first juvenile champion since Street Sense (2006) to win the 1 ¼ mile Travers, and the first Haskell winner since Point Given in 2001 to take the Spa's marquee race. In all, six Haskell winners have completed the double since 1960. Good Magic officially worked alone, but was joined briefly by an unraced 2-year-old in his journey around the track after the renovation break. Good Magic's time was the fastest of 17 at the distance. Brown, who worked a phalanx of stakes hopefuls, said Travers contender Gronkowski would have his final prep for the race on Saturday or Sunday, depending on the weather. Making their final Travers Day preps on Friday for Brown as well were Lewis Bay, who was caught going a half-mile in 49.09 for the Grade 1 Ketel One Ballerina and Grade 3 Shuvee runner-up Wow Cat, who went a half in 48.44 for the Grade 1 Personal Ensign. Gary Barber's Wonder Gadot completed her major Grade 1 Travers preparations with a four-furlong bullet work early Friday morning as she tries to become the first filly to win the Mid-Summer Derby since 1915. With exercise rider Chris Galloway aboard, the Mark Casse trainee worked solo over the main track before 6 a.m., breezing in a swift 47.60 seconds, the fastest of 67 at the distance. Wonder Gadot covered the first quarter-mile in 23.81 and galloped out five furlongs in 1:00.66, according to NYRA clockers. “She goes in 47 and three[-fifths] like most horses go in 51. She's truly amazing.” said Casse. “She's sharp. She has a high level of energy all the time. By the time she's finished cooling out this morning, she'll be jumping around and trying to kick people. The work was her second at Saratoga since winning the Prince of Wales by 5 ¾ lengths over males on July 24 at Fort Erie, the second leg of Canada's Triple Crown. 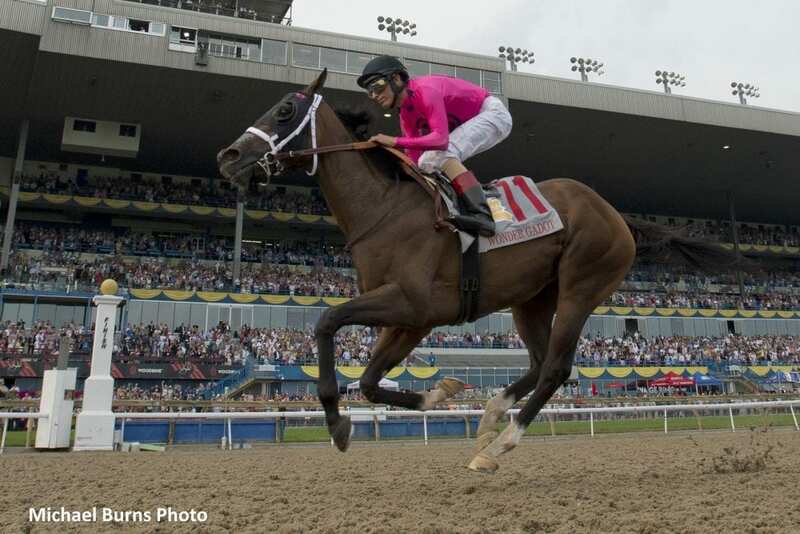 The 3-year-old Ontario-bred filly by Medaglia d'Oro won the first leg with similar ease, taking the 1 ¼-mile Queen's Plate by 4 ¾ lengths on June 30 over Woodbine's Tapeta course. Last year, Wonder Gadot won the Grade 3 Mazarine and Grade 2 Demoiselle, and hasn't finished worse than third in eight starts in 2018, including a runner-up finish to Monomoy Girl in the Kentucky Oaks on May 4. Wonder Gadot will enter the 1 ¼-mile Travers with a record of 5-4-3 from 13 career starts for more than $1.3 million in earnings. Casse said an announcement regarding the jockey assignment is expected on Monday and mentioned Hall of Famer Mike Smith, Florent Geroux, and Tyler Gaffalione as possibilities. Hall of Fame jockey John Velazquez, who rode Wonder Gadot to victory in the Queen's Plate and Prince of Wales, has the call aboard Vino Rosso in the Travers. This entry was posted in Racing and tagged Chad Brown, Curlin, good magic, gronkowski, jose ortiz, Mark Casse, medaglia d'oro, mid-summer derby, saratoga, travers, vino rosso, wonder gadot by NYRA Press Office. Bookmark the permalink.